Incline linebacker Jorge Cardiel tries to bring down North Tahoe quarterback Thomas Mercogliano. 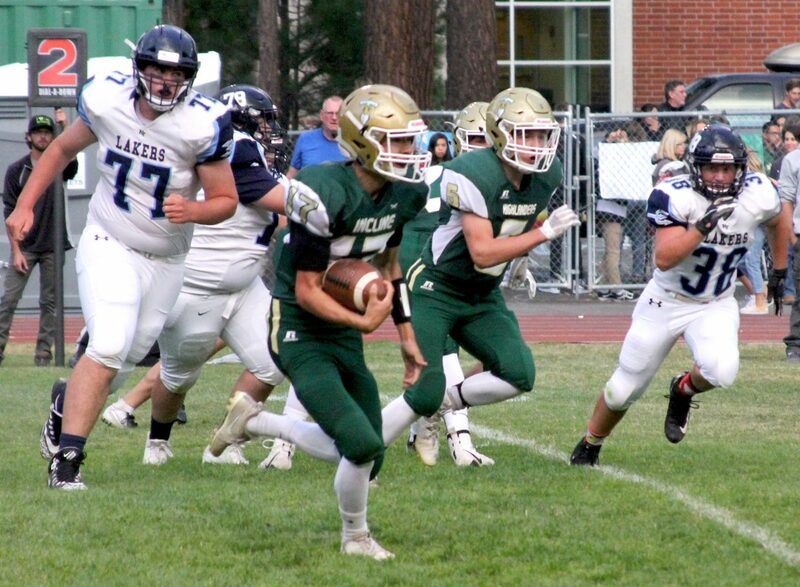 Incline quarterback Dylan Cleary slices through the North Tahoe defense Friday night for a big gain. Incline's Kai Martinez returns a kickoff in the first quarter. Incline linebacker Jorge Cardiel reacts to a pass. 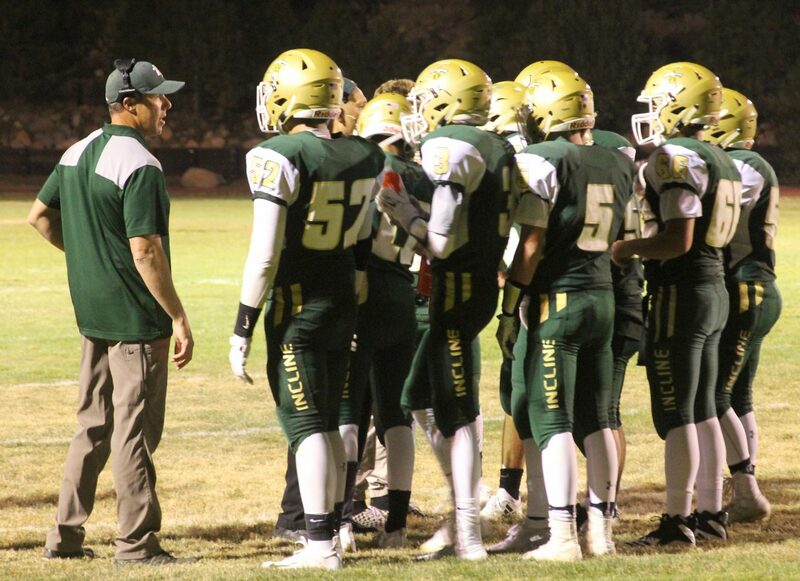 Incline head coach Brian Martinez talks with his team Friday night during a timeout. 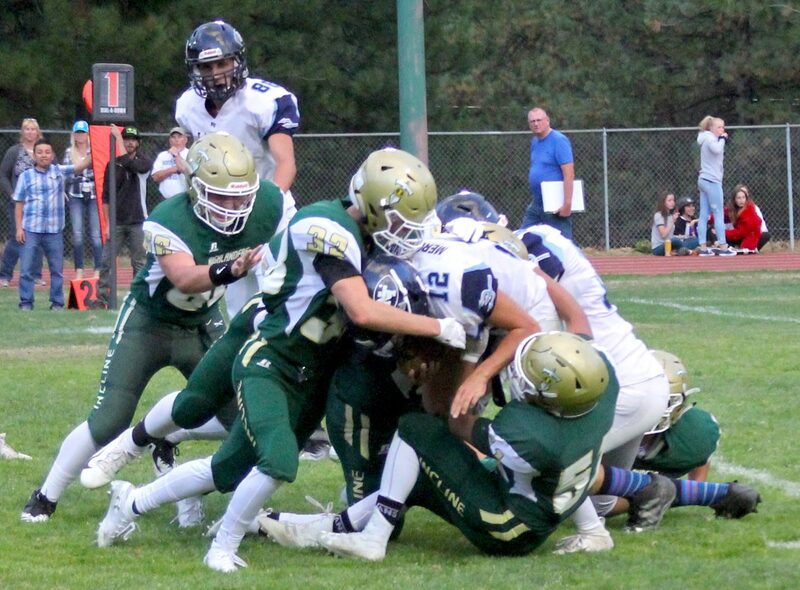 Incline gang tackle North Tahoe quarterback Thomas Mercogliano. 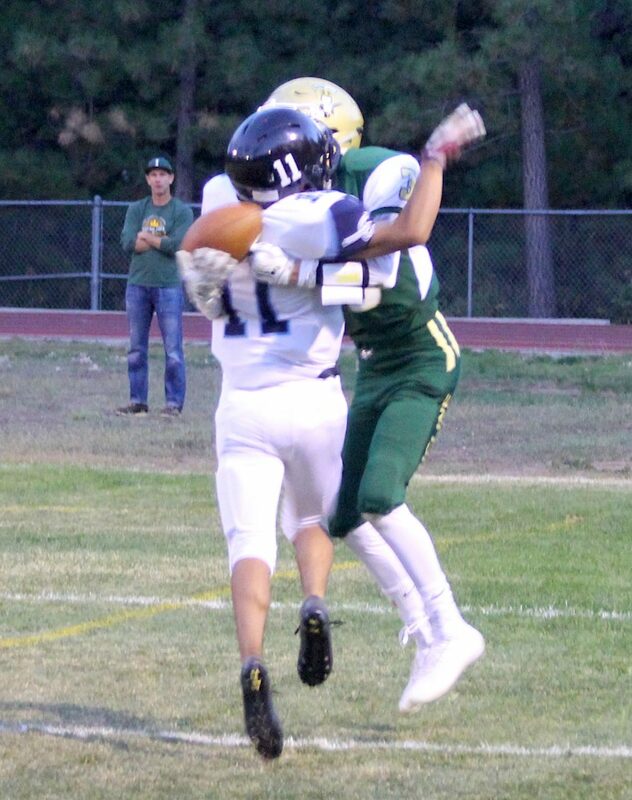 Incline receiver Zach Pexa tries to make an impossible catch and briefly pinned the ball against a defender's back. Incline receiver Keenan Collier hauls in a 44-yard reception to set up the Highlanders third touchdown in the first quarter. 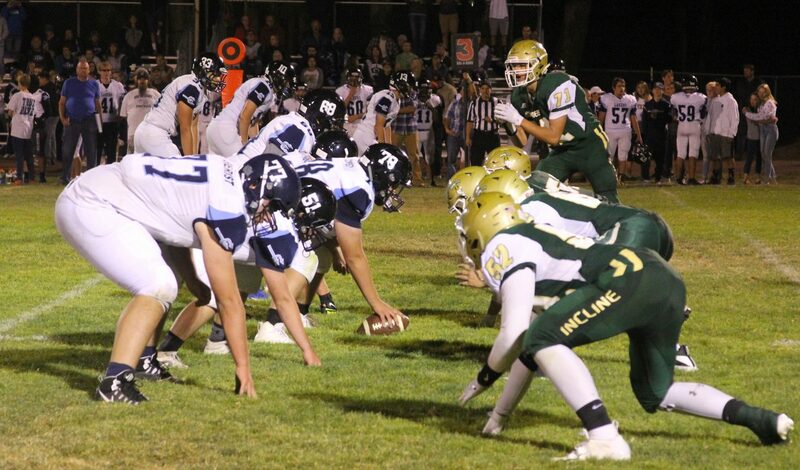 Incline's defense sets up against North Tahoe's offense. 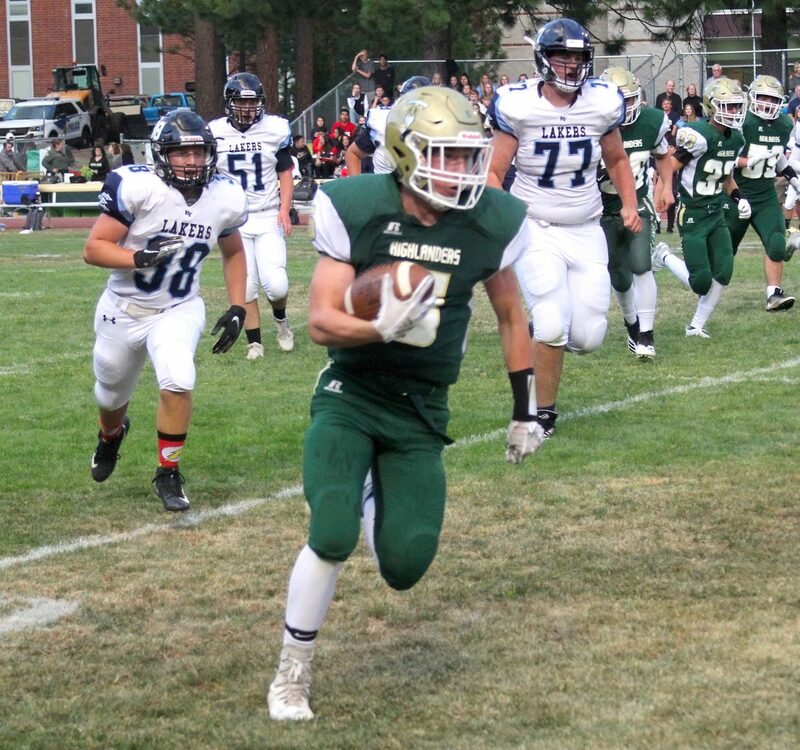 Incline's Brad Rye runs for a 34-yard touchdown Friday in the first quarter. After four quarters and nearly three hours of both teams taking rides on an emotional rollercoaster, the Highlanders prevailed 39-28 over their friends and rivals. As the final seconds ticked away, Incline’s student body stormed the field and celebrated with their team at midfield as it shook hands with the Lakers. The game was back and forth and up and down and all over. The Lakers struck like lightning. The Highlanders scored 26 straight points. 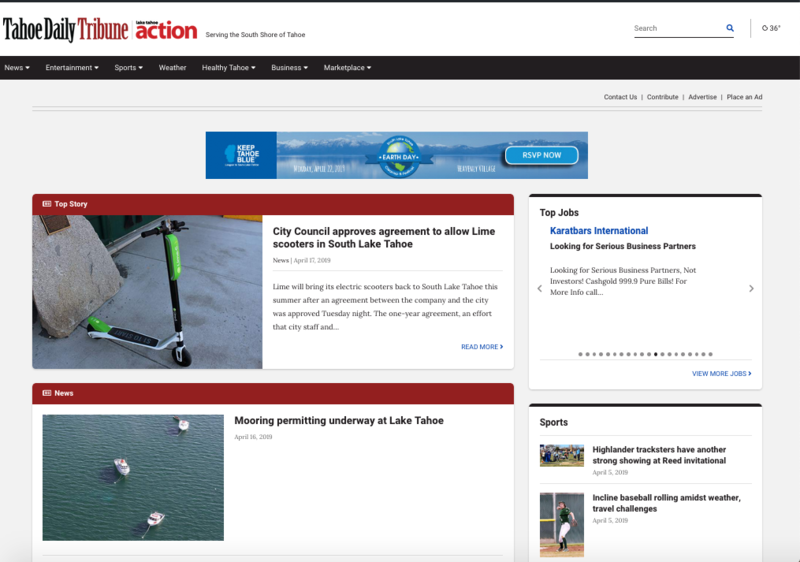 North Tahoe scored 22 consecutive points forcing Incline to rally. In between the emotional point swings, was off the charts sportsmanship. Make no mistake, these teams wanted to beat each other. Badly. But after every whistle were opponents helping up one another … and even offering medical assistance. 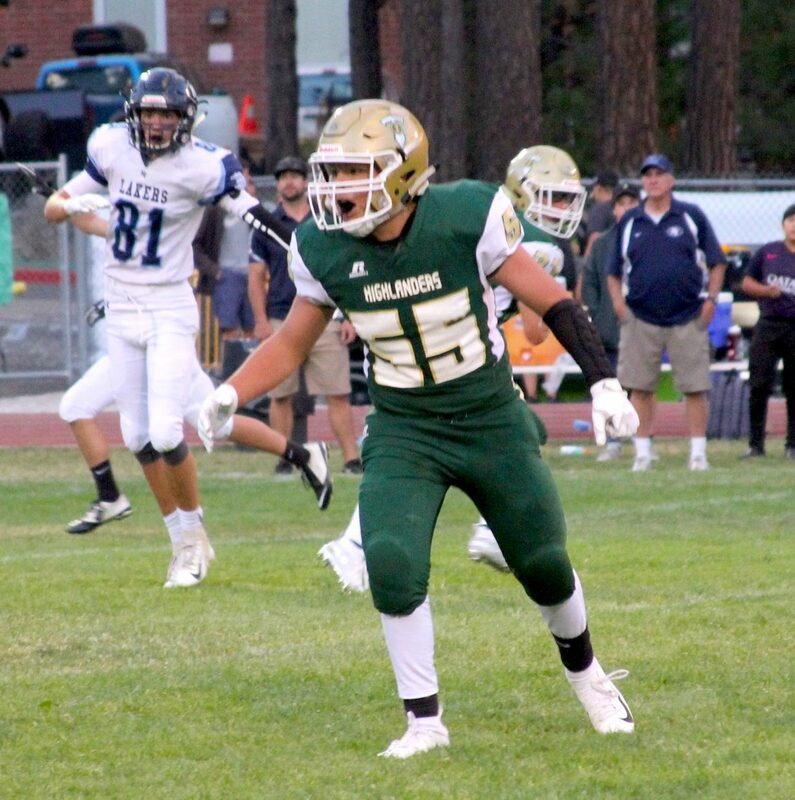 North Tahoe star quarterback Thomas Mercogliano suffered through leg cramps most of the night and still had a monster game, but his best move came when helped stretch Highlander Christopher Vaughan when his leg cramped after a play. “These boys they play, they pick each other up, pat each other on the back and their quarterback running around stretching our guy, like I said, we all love each other,” said Highlanders head coach Brian Martinez. Brad Rye rushed for three touchdowns and Cleary threw for two and ran for another to offset Mercogliano’s four total scores as the Highlanders opened Northern League play with a victory and, probably more importantly, grabbed lake bragging rights for the rest of the year. North Tahoe started with a bang. Mercogliano threw a perfect 64-yard bomb to Cooper Kohnen to give the Lakers a 6-0 lead 58 seconds into the game. 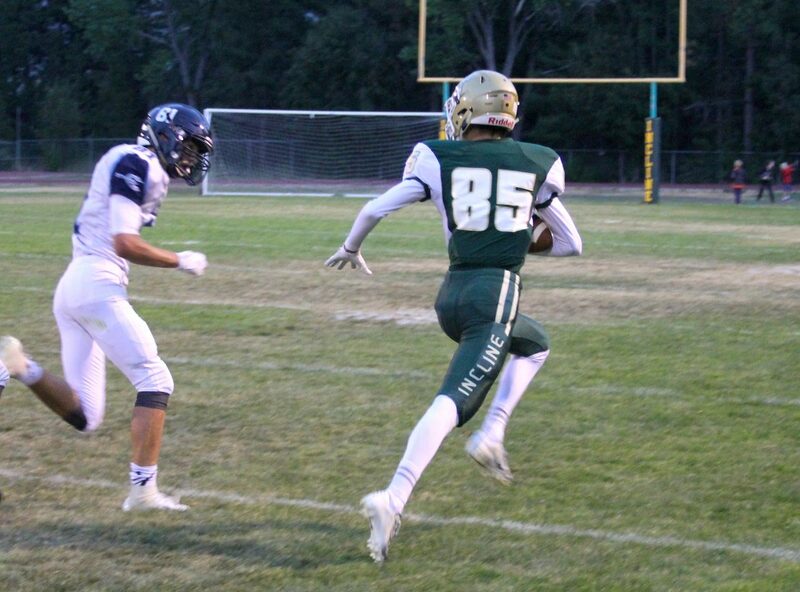 Incline answered two minutes later when Cleary connected with receiver Zach Pexa for a 10-yard touchdown. Also on the drive Cleary hit Jeremy Page for 43 yards and Gage Pierce for 16 yards. Highlander linebacker Jorge Cardiel had a big say in stopping the Lakers next drive. The sophomore made a tackle for a four-yard loss and sacked the elusive Mercogliano for another five-yard loss. Cardiel also had the hardest and loudest hit later in the half. He filled a gap with force and smashed a ball carrier for a two-yard loss. After a Laker punt, Highlander running back Brad Rye ran for a 34-yard touchdown on the next play to make it 14-6. Incline made it 20-6 on a Rye 13-yard run with 10 seconds left in the opening quarter. The big play on the drive was a 44-yard reception to Keenan Collier on third-and-11. Cleary scored on a 1-yard plunge to make it four straight Incline touchdowns, 26-6, after falling behind early. The speedy Cleary also had runs of 13 and 26 yards on the scoring drive. The Highlanders were dominating and it looked like it could get ugly. 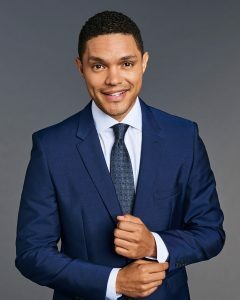 But, wow, no way. The tide turned in favor of North Tahoe right after the Lakers suffered a devastating hit, turning it over on downs at the Incline 5. Cleary was sacked for a safety on the next play to make it 26-8. North Tahoe got the ball back and took just four plays to hit pay dirt and get within two scores, 26-14, at halftime. The Lakers grabbed the lead in the third quarter on two scoring runs by Mercogliano. The first was a one-yard bull rush into the endzone, the second was maybe the play of the game. 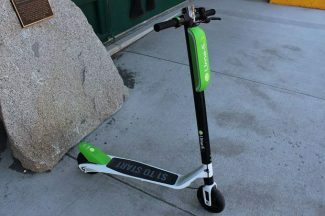 “He’s very slippery, real good,” Cardiel said. On the last play of the quarter, Mercogliano rolled right, found no receivers, brought the ball down and beat the defense to the corner and turned upfield. He cut to the middle of the field and knifed through what seemed like the entire Incline defense. His progress looked stopped from the home sideline, only for him to reappear and dive into the endzone for a 50-yard touchdown and a 28-26 lead. 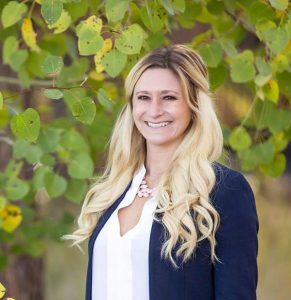 Incline took advantage of a North Tahoe turnover to take back the lead for good. Collier recovered a fumble deep in Lakers’ territory on a punt return and set the Highlanders up at the 21. With 5:47 left, Cleary dropped backed to pass. 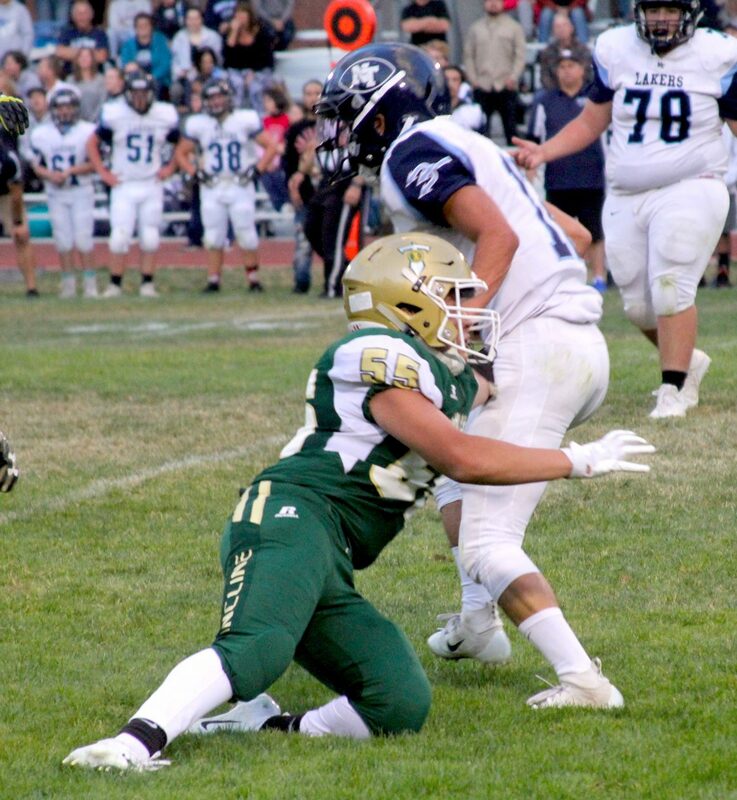 Incline led 32-28 and North Tahoe shot itself in the foot when a bad snap forced the Lakers to punt from their own 6 with just under four minutes left. Rye scored the final touchdown on a 28-yard run with 3:26 left. Cleary was 13 for 28 for 248 yards and also rushed for 65 yards on 11 carries. Rye had 96 yards on 15 attempts and also caught five passes for 74 yards. Mercogliano rushed for 152 yards on 26 carries and also threw for 189 yards. Kohnen caught three passes for 124 yards. 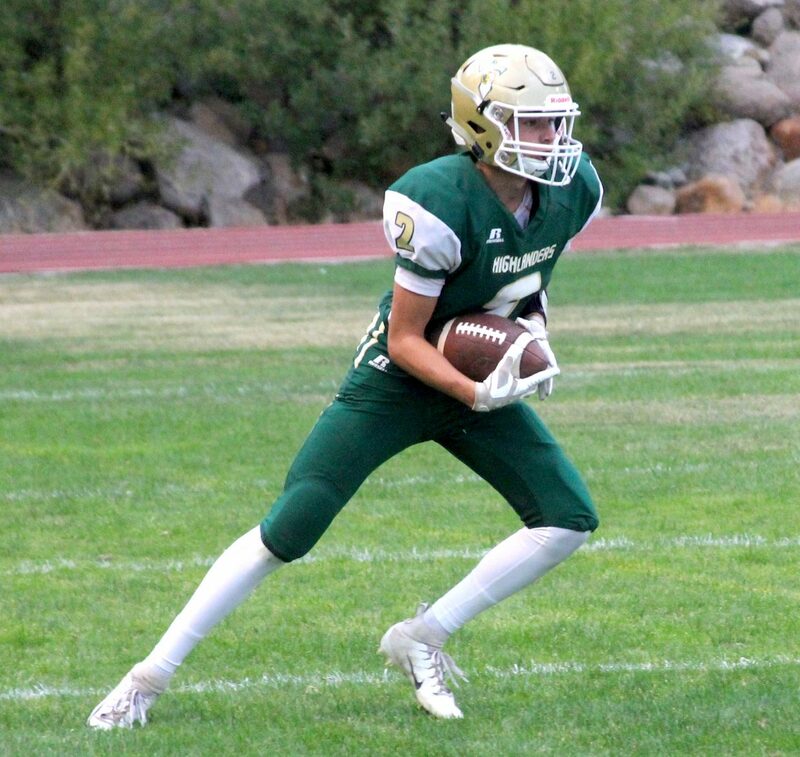 Incline (2-0, 1-0 Northern) next will host a Thursday night special next week at 7 p.m. against the Yerington Lions.